Today, the Episcopal Church celebrates the Feast of the Holy Name of Jesus. Most families view naming our children as an incredibly important decision. Many ponder the issue for months, and even years. Often, the name of a child will ring with significance for the family, sometimes borrowing the name of the father or of an important ancestor. Sometimes, families will examine books filled with baby names and their meanings. Sometimes, parents name the child after a city, or favorite character in a book or a movie. How then, does one go about naming the incarnate son of God? Now, throughout the Old Testament, we encounter several stories of God being pretty careful about revealing his name. In Exodus, God tells Moses: “‘I am the Lord.’ I appeared to Abraham, Isaac, and Jacob as God Almighty, but by my name ‘The Lord’ I did not make myself known to them.” Ex. 6:2-3. Similarly, God tells Moses, “I Am Who I Am.” Ex. 3: 14. This divine ambiguity becomes so ingrained into the Jewish understanding of the divine that the name of God could not, and still cannot, be spoken by the Jewish people. Luke’s Gospel reports that Gabriel told Mary to name the child “Jesus” (Yeshua in the Hebrew). Luke 1:31. Mathew reports that an angel of the Lord instructed Joseph to name the child Jesus. Matt. 1:21. In both stories, God clearly directs Jesus’ parents about his name. Jesus’ name results, therefore, from both divine and human activity. In first century Palestine, the name Yeshua (“God saves” or “God is salvation”) was a fairly common name. It echoed with meaning, invoking the name of one of the heroes of the Exodus, the central narrative of the Jewish people. But I think there’s something more at work here: in the very name of his incarnate son, God engages in the process of self-revelation. The Lord is telling us what He’s like, answering questions the Jewish people had raised for years about the nature and name of God. Traditionally, devout Jews named their male children as part of the rite of circumcision, which constituted part of the Abrahamic covenant. We find God’s self-revelation, then, in the midst of the ritual fulfilling the covenant. And God, through his participation in the naming of this child, reveals Himself and Jesus’ mission to us: salvation. One of my favorite monastics, St. Bernard of Clairvaux, wrote about the name of Jesus. He said that the Jesus’ very name was light, food and medicine. Jesus brought light into the darkness of a world dominated by power, dominance, sin and death. John’s Gospel teaches that Jesus “was the light of all people. The light shines in the darkness, and the darkness did not overcome it.” Jesus described himself as “the bread of life.” He brought food that “restores the wearied faculties, strengthens virtue, [and] gives vigor to good and holy habits…” Bernard of Clairvaux, 15th Sermon on the Canticle of Canticles. The name of Jesus serves as medicine for souls in torment, and all the illnesses of this world. We remember how often Jesus was engaged in healing, and how the disciples were able to heal through the invocation of Jesus’ name. In the life of Christ, God has revealed Himself as meek, humble and self-denying. In the name of Jesus, God tells us that He is deeply concerned with our salvation. In the midst of the muck and stench of the manger, through the joy of the wedding at Cana, in the sorrow of Lazarus’ tomb, and despite the horror of Golgatha, God saves. That’s got to be Good News. This entry was posted in Uncategorized and tagged Anglican, Bible, Disciple, Bernard of Clairvaux, Christianity, Episcopalian, Feast of the Holy Name, Jesus, Salvation, Spirituality. Bookmark the permalink. Great post and very meaningful as I woke up with the hymn ‘At the Name of Jesus’ in my head a few weeks ago. -the interesting icon, is it eastern european? -also I saw two monks in my sleep last night wearing white habits with black lining inside the cowl, and a black knotted cord. Even though I was convinced one of them was St. Francis trying to tell me something as I’ve seen him before. Do you know what brothers wear such habits? I woke up feeling very thoughtful but about what I could not begin to guess. Regarding the icon, yes, I think it’s Eastern European. 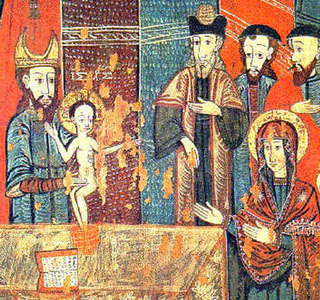 It’s from the Church of Archangel Michael at Sarisky Stiavnik, District Svidnik, and is tempera on wood. I do not know of an Order that wears habits like those, although what you’re describing is very close to the habit of my own Order, the Dominicans. Although we wear white cassocks and black cinctures (cords), however, our cowls are completely black, rather that just a black lining. I’ll be on the lookout for something matching that, but I think what St. Francis was trying to tell you may be more important. Thank you for the reply and guidance re St. Francis. These things take time to ponder quietly and good direction which I am still trying to find. I am getting a very strong urge for an extended time of silence and prayer, so that is what I will do. I think we should not take such urges lightly. God grant you rest and reflection. I enjoyed this post. Happy New Year and my prayers for your intentions in 2012! I’m so glad you did, Jeffery. Have a wonderful New Year, and my best to you as well. James, this is a lovely meditation on God’s saving and healing power through the name of Jesus. I reflect, too, on the power of naming that God gave adam and how we so often abuse it. Devout Jews do not even speak the name of the male child until the rite of circumcision–eight days of restraint in honor of God and God’s blessing, eight days that seem to add weight to the power of a name. Birds, flowers, illnesses, neighbors. Without names we cannot even begin to know and understand them. With names carelessly and ignorantly given, we cannot begin to accept or love this “other thing.” What we call each bit of God’s good creation affects our attitude toward it. As we honor the name of Jesus, we might also think of our responsibility of honoring those people and things he loved so completely, but we know only as Another or Like-All-of-Them. More restraint and more holy naming might give us the power to heal ourselves of indifference, prejudice, and hostility. That is beautiful, Lera, and full of truth. Thanks so much for these thoughts. As Heidegger observed, I think language does more than describe the world; it actually creates our world. We should use our words and our language (the names of things) so much more carefully than we do. Names and words have the power to heal or cripple. Lord, let us use this gift to heal the world. Is there any wonder why Dominicans traditionally bow at the mention of the the Name? I think the practice serves as a vital reminder, for me at least…. Dear Brother James–What a lovely site you have created. I do appreciate your insights and musings, but I am in awe of the visual appeal you have created. As a novice blogger, and no geek, I have yet to figure our how to personalize my blog visually. Like our holy founders, who so encouraged one another so warmly, let us continue to encourage and stimulate one another in this blessed New Year.